Concerto Köln must be lauded and thanked again for unearthing and bringing back to us from oblivion such treasures. 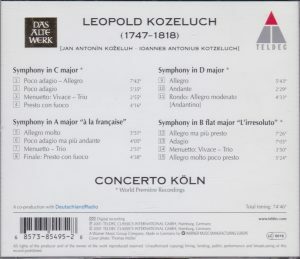 This CD with four symphonies of Leopold Kozeluch, recorded in November 2000, is one in a sizeable series of recordings/rediscoveries, shared mainly between Teldec and Capriccio, of composers from the late 18th and early 19th centuries that were almost blotted out of posterity’s memory by the universal fame of Haydn, Mozart and Beethoven: among these (in no particular order), Vanhal (Teldec 7 0630-13141-2 8), Kraus (Capriccio 10 396 and 10 430), Myslivecek (“Il Divino Boemo”, Archiv Produktion 477 6418, barcode 028947764182), Cannabich and the Stamitz father and sons “Mannheim: The Golden Age (Works by Christian Cannabich, Carl Stamitz, Anton Fils, Johann Stamitz, Ignaz Fränzl, Teldec 6 3984-28366-2 3), Rigel (Berlin Classics 0016432BC, barcode 782124164324), Wilms (Archiv Produktion 474 508-2 barcode 028947450825), Rosetti (vol. 1 Teldec 7 4509-98420-2 4, vol. 2 Teldec 7 0630-18301-2 3), Eberl (Teldec 6 3984-22167-2 2), Brunetti (Capriccio 10 489, barcode 4006408104896), the Bach sons (Capriccio 10 283, barcode 4006408102830), Gossec (Capriccio 67 073, barcode 4006408670735) and the composers of the French revolution (on Capriccio 10 280) – and that’s excluding the recordings of concertos made with fortepianist Andreas Staier (Dussek and Salieri are out). I’ve reviewed many of those CDs. 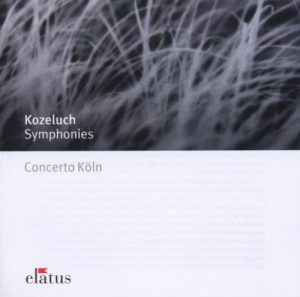 This Kozeluch CD is one of the best of the series. Kozeluch was born near Prague and his dates (1747-1818) make him Haydn’s younger by 15 years and Mozart’s elder by 9. He was one of the most sought-after composers of his time, and hearing the four symphonies gathered here, one understands why. But two of the symphonies are still unpublished (or were when the recording was made), and it is difficult to say whether this factor is cause (it was customary in the classical era that compositions were published only after a long delay – keeping exclusive possession of the manuscript and parts was the only way for composers to retain copyright on their works and derive financial benefits from their performance) or consequence of the fact that Kozeluch soon fell out of sight in the 19th century, when Haydn and Mozart didn’t. Posterity’s ways are very mysterious – and mind you, the mystery is not so much that all the Kozeluchs, Vanhals and Krauss disappeared: before the era of sound recordings and “contemporary” music, the previous centuries were not turned to the past, and musical sensibilities dramatically changed between 1800 and 1830; the mystery is that despite all that, Haydn and Mozart remained; maybe there is just so much of the past that the Romantic era could remember, and these two fulfilled its needs. 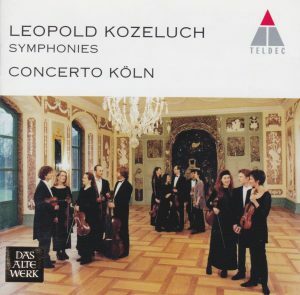 Stylistically, the symphonies of Kozeluch fall between the finales of Mozart’s late operas and Beethoven’s early symphonies: powerful, dynamic, dramatic, with boisterous and vigorous scherzos and triumphant finales. Even when the slow movement of Symphony in A major (track 6) starts deceptively, in a fleeting march-like tempo and a galant style, it displays wonderful twists of invention, like the tempestuous tremolo erupting at 1:08. 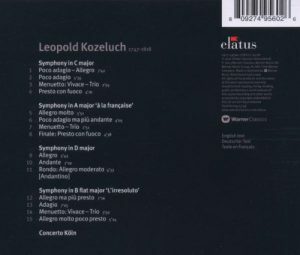 Symphony in D major – the first published Symphony of Kozeluch, in 1786, but deriving from ballet music composed in 1776 – is the most archaic, and not only formally (it has only three movements). Symphony in B flat major “L’irresoluto” is the most original in its construction and emotional trajectory, almost a “stream of consciousness” composition with great jumps in moods, and in which each movement links to the next. Other than its own appeal, one of the reasons to listen to the music of Kozeluch and all those now all-but-forgotten contemporaries of Haydn-Mozart-Beethoven is to better understand the soil from which the latter emerged. But the more I listen to the music of that era (I’ve recently reviewed CDs of piano music of Clementi and Vorisek as well), the more I am tempted to reverse the statement: other than understanding better the soil from which Haydn-Mozart-Beethoven, the main reason for listening to the music of Kozeluch etc. is that it offers great musical rewards. Amateurs of Mozart-Haydn and the first two symphonies of Beethoven, give it a try.